Tea Collection was born in San Francisco, and like the eclectic city from which it was created, it is inspired by the world. Enjoy the flavor of places far and wide... without ever having to leave home, necessarily. Tea Collections continues into 2017 with another installment of their line inspired by the great Down Under---Australia. #1. 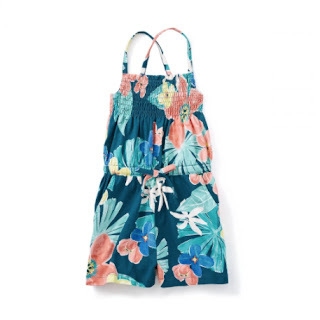 Whether you're planning on a vacation, staycation, or neither this summer, you can enjoy a little bit of paradise at home---and everywhere else you go---with the Coral Fern Smocked Romper. We can't get over how stunning this sweet little number is. Available for toddlers up to preteen with sizes from 2 to 12. This lovely romper is only available in "Deep Sea," but let's not kid ourself... who would pick another color over this print? #2. The Bloomfield Tiered Sundress in "Indigo" is the type of wardrobe staple you'll find yourself grabbing for all season long (or longer!). With the subtle beauty and neutral color, it's sure to go with almost everything---if not every single thing---in your little girl's wardrobe! Find this piece on the Tea Collection website in sizes from 2 to 12. #3. 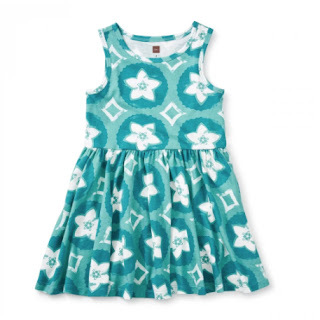 Another great wardrobe option for little citizens is the Queensland Tank Dress in "Glaze Blue." This apparel item is especially gorgeous when paired with the Old Soles Mantra Sandal. This style is certainly comfortably, and easily casual or dressy depending on what it is worn with. #4. 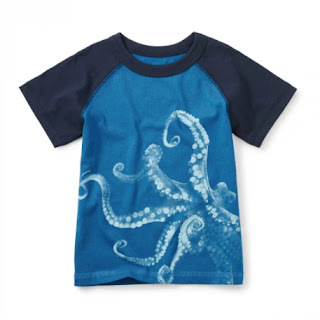 Vibrant and artsy, we think the Tentacles Photoreel Tee would pass the "cool test" for most boys of all ages. After all, how can you argue with a t-shirt depicting a creature from the deep that is funky looking and slimy? You reel-y can't lose! This unique tee is exclusively available in "Olympia" in sizes 2 up to 12. #5. For the Forest Dragon Graphic Tee you'll find lovely shades of blues and greens married with white to comprise a lizard on this brown tee. An option neutral enough to carry you well into the warmer days of the autumn season. Available in "Tortoise," in sizes from 2 to 12, this tee may become a favorite for both you and your child when coupled with the Appaman Houston Fedora---a truly irresistible combination! #6. 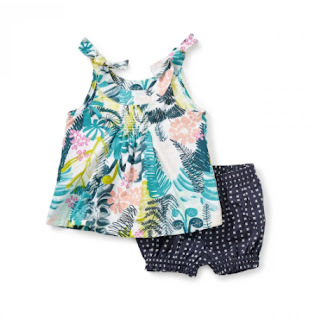 One pattern and two solid pairs of shorts come together in a package deal for this set, a practical choice for the blazing heat in the summer months ahead. We'd place the This Way to Wonga Set under the category of wardrobe staples. The striped pair are an excellent option for the Tentacles Photoreel Tee above, and the blue and light grey pairs will go with nearly everything else! The set, available in "Multi," comes in sizes as small as 3 and as large as 12. #7. We've seen the forecast for this summer---and it's filled with rompers! It's hard to argue with the practicality of this all-in-one type of style which you'll find in sizes ranging from 0-3 months to 18-24 months. The littlest citizens are well-suited to the most sweet and charming pieces, and the Locals Only Two-Tone Romper in "Soft Peach" certainly fits the bill! This styles offers black and white stripes and are put together with a butterfly pattern for a result that's quite delightful. #8. The best of both worlds from the Coral Fern Smocked Romper and Bloomfield Tiered Sundress is none other than the Botanical Baby Outfit in "Chalk." Too precious for words, we think the best description for this set might be "a little bit of the old and a little bit of the new." The shorts are too cute and could almost be a retro piece, and it's absolute perfection with the colorful pattern of the top. This combo available in 3-6 months up to 4T is photo-ready! #9. 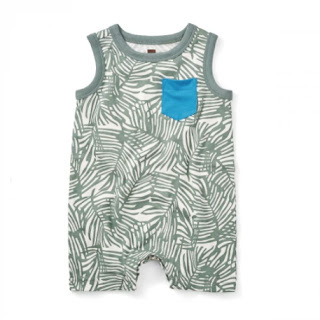 Adorable romper overload continues with the Dicksonia Antarctica Tank Rmpr. 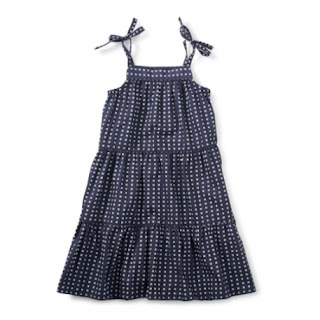 We can picture an infant or toddler sporting this cute piece with a pair of brown sandals at the beach on a warm summer day. Might we suggest the Livie & Luca Captain Sandals? It's a match made in heaven! You will find this boys' romper in "Olive Drab" on Tea Collection in small sizes starting with 0-3 months and up to 18-24 months. #10. To boldly go where no tee has gone before! Who wouldn't adore the Apollo Bay Pocket Baby Tee? This style is for infants starting at 3-6 months and up to toddlers wearing 4T. 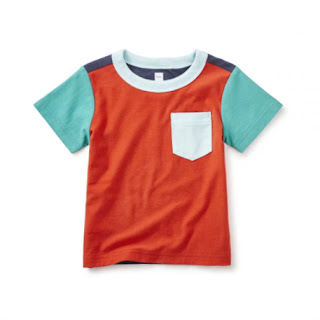 Four colors are featured on this color block tee, making it perfect to pair with just about any pants or shorts. Need we say more? Also available in "Paprika" and "Royal." How are you spending Memorial Day weekend? Tell us all about it in the comments below! And, of course, the holiday weekend also means: sales! Don't miss out on this opportunity to stock up on amazing apparel for the little citizens in your life with the Tea Collection Memorial Day weekend sale offering 25% off. You can find all of the items listed above and much, much more! 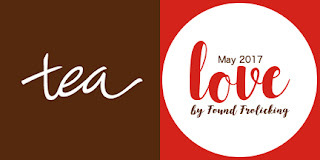 Use the code LORIKEET at checkout. We are spending Memorial Day weekend by re-doing our kitchen floor. Exciting stuff. Love these cute clothing line. I never heard of this brand before but the designs look super fun. #5 & #6 will be perfect for summer wear. I've never heard of this clothing line, but I love the clothes. And, my Memorial Day was spent indoors thanks to the never ending rain we've been having. Cute outfits to look forward to for the summer! I think these aren't just stylish but comfy as well, perfect for the warm weather, without a doubt. Such a cute clothing line. I love the colors they look so nice for summer. Oh my goodness! These outfits are adorable! 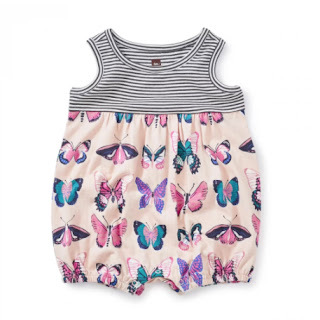 I would love the butterfly romper for my little girl. Awe this is too adorable! I have to show this to my cousin who has a little boy! I spent my Memorial Day weekend with family and friends! Super cute! I love these outfits. These outfits make me want to take a tropical vacation! I'm so glad summer is almost here. 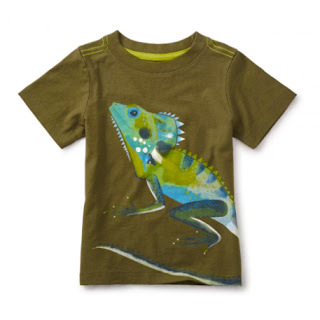 I love Tea clothing for kids! They have the cutest outfits. This collection is gorgeous, I really like the tropical prints.